In this interview, Paul Cheshire shares his over 50 years of experience on urban economics. He talks about why “land is making a comeback”, reasons for the dramatic turnaround in the value of land, the “key tools in the urban policy box”, and more. Cheshire is Emeritus Professor of Economic Geography at the London School of Economics. Hites Ahir: You have been doing research on urban economics for over 50 years. What got you interested in this topic? Paul Cheshire: I was brought up in London and was always fascinated by it and cities generally. As a student at Cambridge, England in the 1960s there was interest in economies of scale but only formulated in the context of manufacturing – already a declining and ex-urbanising sector. Since cities obviously had costs, I realized they must offer important agglomeration economies. Nowadays this is generally accepted by economists but then it hardly featured on their antenna. Something we still know very little about is agglomeration economies in consumption: I am fond of illustrating with the example of my wife and myself. She is an opera lover and I am a football fan. Only in a really large city like London can one enjoy top class examples of either. But we can get to Arsenal or to Covent Garden, world class examples of both, in 25 minutes. There are many types of agglomeration economies in consumption and we really know very little about them still but my assessment is that cities are the most welfare enhancing human innovation in history: they empowered the division of labour, the invention of money, trade and technical inventions like the wheel – let alone government, the arts or culture. Hites Ahir: “The Economics of Land Markets and their Regulation” is a book that you have co-edited with Christian Hilber. In the book, you say “land is making a comeback”? What do you mean by it? Paul Cheshire: Classical economists devoted far more effort to trying to understand the returns to land than they did to labour or capital: it was both the most important asset and the most important factor of production. When Adam Smith was writing only about 12 percent of Europe’s population lived in cities and even in the most industrialised country, Britain, the value of agricultural land was about 3 times that of annual GDP. But as the value of other assets increased, interest in land diminished so that by about 1970 really only agricultural economists and a few urban economists were interested in it: and they did not talk to each other. But by 2010 residential property, mostly the land on which houses sat, was worth three times as much as British GDP. By the end of 2013 houses accounted for 61 percent of the UK’s net worth: up from 49 percent 20 years ago. Land, now urban land, is valuable, so there is renewed interest. Hites Ahir: What are the reasons for the dramatic turnaround in the value of land? Paul Cheshire: There are two main reasons. The first is the increasing importance of agglomeration economies fueling demand and the second is restrictions on urban land supply. The now dominant service sector has major agglomeration economies: think of business, financial or cultural services, the media or even tourism. Add this to the growth of human capital and two worker households and agglomeration in consumption, and you have the resurgence of large cities. But policy increasingly restricts the supply of urban land with growth boundaries or Green Belts. Historically we made lots of urban land. We built commuter rail, then highways. So at the urban fringe land supply was perfectly elastic. The supply price of land for housing was essentially the price of farmland plus a mark-up for infrastructure. Britain imposed its first Green Belt in 1955 and now, if re-zoned for building, farmland at the built edge of London has an 800-fold mark-up. 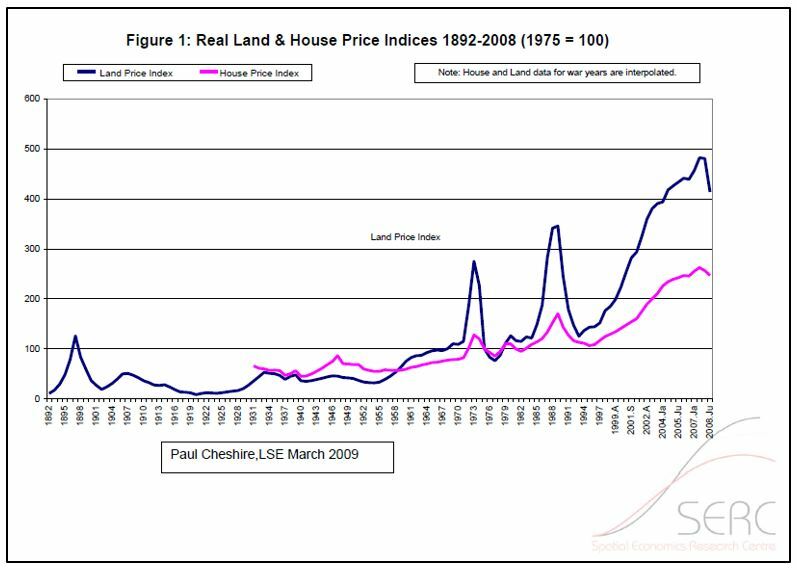 There was no secular trend in housing land prices in Britain until the mid-1950s [see the figure below] but after Green Belts were imposed real prices increased some 15-fold. More than houses because you can substitute land out of house production. There is a similar pattern in Canada, New Zealand or the West and East coasts of the United States where policies restrict land supply. Hites Ahir: “Urban Economics and Urban Policy Challenging Conventional Policy Wisdom”—is a book that you co-authored with Max Nathan and Henry Overman. In the book you talk about the “key tools in the urban policy box”. What are these tools? Have they worked? Paul Cheshire: Luckily cities are so resilient because urban policy is generally so bad! Maybe Germany comes closest to good urban policies. Policy has been dominated by physical and design ways of thinking: great for building those fantastic innovations of the 19th Century – sewers or water supply. But not useful for facilitating urban growth and offsetting for the costs of city size. We know cities keep on getting more productive the bigger they are but some costs – the price of space, congestion, for example – also increase with city size. So urban policy should offset for those costs. Instead it mainly increases them. Popular policies of densification and containment restrict the supply of space, increasing its price as cities grow so we forego socially valuable agglomeration economies. Another popular policy – height restrictions – reduces gains from ‘vertical’ agglomeration economies. Nor is policy very effective with congestion. The trick should be to ‘plan for growth’. By that I mean preserve access to green space – and also co-ordinate development with infrastructure both now and for the future. One of the tragedies of cities such as Lima is you have a handsome working city of a million or so people now entirely hemmed in by high density, unplanned and unserviced settlement – even cutting off the airport. It is incredibly expensive to retro-fit infrastructure. In London, we are managing it differently: we are investing £18billion on a new rapid transit system – CrossRail – opening up huge areas for housing but not a single house can be built once you cross the boundary into the Green Belt, well inside the administrative area of London itself. Another endemic problem of urban policy is what I have called ‘faith-based displacement activity’ – spending resources on problems urban policy cannot solve, such as societal inequality. A truly serious problem but not susceptible to being solved by insisting on ‘mixed communities’ or neighbourhood revitalization. Neighbourhood revitalization has its place but not as a tool to produce greater equality in urban society. Hites Ahir: So, how can urban policy be improved? Paul Cheshire: Policy needs to work with the grain of the market to offset for the real problems of market failure in land markets and in cities. We also need to provide social, below market cost housing more effectively for those who cannot get their lives together to access decent housing via the market. We should have policies to make housing more affordable – ensuring adequate land supply while preserving plenty of green space – but additionally have policies to pay for social housing transparently. This could be done by a levy on the value of new development dedicated to providing social housing and supporting infrastructure. The levy’s costs would be capitalized back into land prices. Hites Ahir: “Urban Problems in Western Europe: An Economic Analysis”—is a book that you co-authored with Dennis G. Hay in 1989. It is also one of your most cited publication according to Google Scholar. In a nutshell, what is the main message of this book? Paul Cheshire: That we knew remarkably little about how cities worked and the sources or scale of their problems: and in particular knew almost nothing systematic about European cities because we had virtually no data for them – even population. Each country had its own data definitions and definitions of what constituted a city and thought their definition was universal. The French had a definition of agglomération based on the physical proximity of buildings. This worked logically in France but applied to Belgium, with its permissive land use regulation, generated just one city stretching from Antwerp to Liège. In Germany even the Federal State of Hamburg contained only about 60 percent of the people who owed their livings to the city’s economy. So one of our first tasks was to decide on a useful definition of ‘city’ and then collect consistent data. We chose Functional Urban Regions – FURs – and even with quite limited data got useful insights and analysed common patterns of development and sources of problems. It is very gratifying that the OECD now generates data for Metro-Regions defined using rather similar methods but it is still true that comparable data for cities is woefully restricted. Hites Ahir: How does the finding of this book ties with latest issue in the Journal of Housing Economics on “Housing in Europe: a different continent – a continent of differences”? This is a special issue that you co-edited with Christian Hilber. Paul Cheshire: How little has changed! The title was meant to send the message that Europe is a distinct continent, has things in common but is so heterogeneous doing useful Pan-European research is a real challenge. Social housing is important in Europe but each country has its own systems. There are also various different but interesting forms of housing finance. But once one gets away from GIS-type data, the depths of our ignorance are horrible. For example, there is no price information on housing across Europe let alone house prices by meaningfully defined city-regions. Even much national house price data is inadequate. The best English data, for example, does not include floor area.